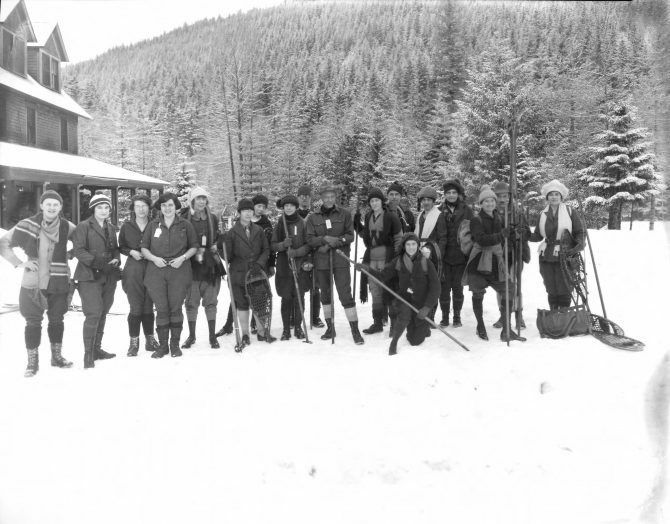 Eighteen members of the Mountaineers Club posed for a group portrait before a background of snow-capped trees in late December of 1922. The men and women were at Longmire, in Mount Rainier National Park, even then a popular tourist destination. 160 Mountaineers left Tacoma on December 28th for their annual midwinter climb up Mt. Rainier. Club members intended to light radium flares on the Mountain on New Year's Eve.